Daniel Craig may get the chance to wear his James Bond tuxedo for a long time. Daniel Craig has been offered an extension of his 007 contract that would result in him playing James Bond for another five films, the U.K.-based The People says, quoting producer Michael G. Wilson in an interview. 1) If Craig agrees to an extension, the actual number of movies will depend on whether Eon is ready to do the 007 pictures on an every-other-year basis. Metro-Goldwyn-Mayer, when it went through bankruptcy, said it planned to release Bond movies on such a schedule. But MGM and Eon share control of the franchise. MGM can’t release movies if Eon hasn’t made one. 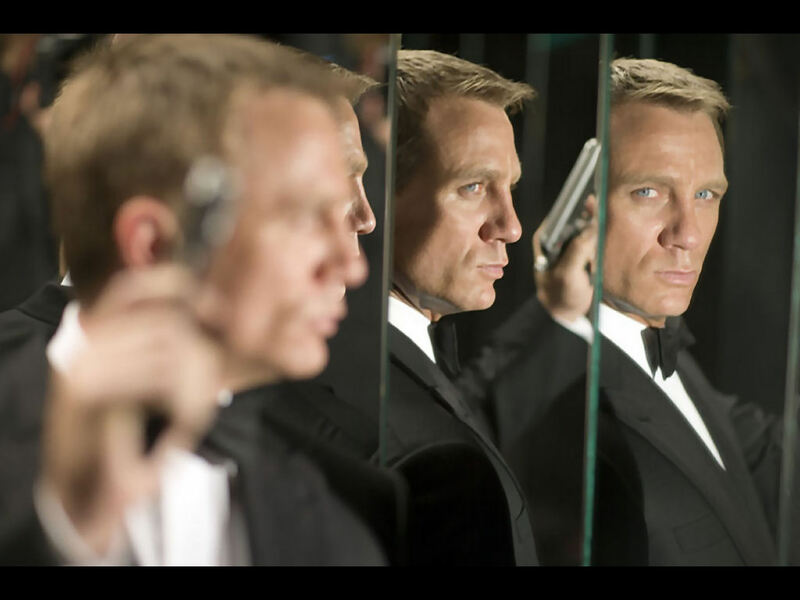 2) Craig will be 44 when Skyfall is released. Another five movies on an every-other-year schedule, would put the actor at 54 when Bond 28 comes out in 2022. If the movies have a 3-year gap here and there, well, he’d be older than that after an eight-film run. Our No. 3 observation: The film will determine if that’s the case. For now, these are only words. One factual error in the story: it refers to producer Barbara Broccoli as being Wilson’s “step-sister.” They are half siblings because they had the same mother, Dana Broccoli. Much as been discussed, amongst James Bond fans, about the current news covering the financial implosion of Metro-Goldwyn-Mayer, as the once-great studio slides into ignominious dissolution. This article at Deadline Hollywood can bring you up to speed on all the details. Suffice it to say that the future of the James Bond film series looks a little dicey right now. Most Bond fans, while not necessarily shrugging it off, point to the six-year delay (due to Danjaq’s lawsuit against MGM/UA,) between Licence to Kill and GoldenEye as evidence that the series has “survived” similar problems in the past. The difference between then and now is that, back in 1989, the series was running on inertia if not actually beginning to wind down. The success of The Living Daylights notwithstanding, Timothy Dalton wasn’t the big hit with audiences the studio was expecting, and Licence to Kill, capping off an uneven decade of John Glen cookie-cutter entries, sputtered at the box office during the summer of Batman. Nevertheless, there was in the background a continuing, palpable desire on the audience’s part to see Pierce Brosnan take up the role of James Bond. That unextinguished flame helped light the way for the triumphal return of the series with 1995’s GoldenEye. That was then. Now we have a “rebooted” series, telling a (new) story of the 007’s career from the beginning, starring one of the most popular and critically-acclaimed actors in the role in history. Chapters 1 and 2 have been enormously successful, and worldwide interest in James Bond hasn’t been this high in decades. But, despite all that momentum, the producers got “tired,” distracted with other projects, and otherwise futzed around with planning the next film — so now there’s nothing in the pipeline when the studio goes kerflooey. Here’s the situation I think the James Bond movies are in: the production company, which owns half of the property, is ambivalent about its commitment to the property. The bankrupt studio, which owns the other half, isn’t going to let one of its few remaining assets get away while fighting for its survival. So… nobody else can make a James Bond movie, and the people who can can’t afford it, and maybe aren’t all that interested in going to all that work anyhow. It’s probably going to take years for things to sort out, after which 1. Their popular leading man will, almost certainly, be gone — and with no heir apparent in sight; and 2. Audience interest will have found other things to glom on to. Sorry to be pessimistic, but I think this is a serious setback for the James Bond movie series — a setback which it’s going to have to, once again, “survive.” How many lives does this cinematic cat have? It survived On Her Majesty’s Secret Service‘s box office drubbing because Sean Connery came back for one more; it survived Connery permanently leaving due to the popularity Roger Moore brought with him; it survived The Man with the Golden Gun‘s failure because EON (and newly-sole proprietor Cubby Broccoli) went balls-to-the-wall making The Spy Who Loved Me; it survived Licence to Kill because people still wanted to see Pierce Brosnan as James Bond. It’s been 47 years and 22 screen adventures for our favorite “gentleman secret agent with a license to kill.” But how many bullets can James Bond dodge? Will he finally succumb to inertia, or will he suffer the death of a thousand cuts, inflicted by the ones who can truly kill him — the lawyers and the MBAs and the accountants?